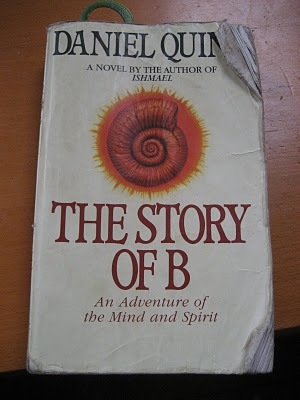 During my research on spiritual fiction, I was recommended to read Daniel Quinn’s books, Ishmael and The Story of B. At my local new-and-used bookstore, Companion Book, I found a cheap copy of The Story of B and I was pleasantly surprised while reading it. It is a unique blend of fiction and non-fiction and the ‘spiritual’ part is based more in biology than in metaphysics. In fact, it is really not that metaphysical at all. I won’t ruin the plot for you by telling you that the main protag is a Laurentian Priest (Christian) who is sent to investigate a group that is preaching a return to animism. The story takes the form of a diary of the priest, written in the first person. One aspect of the book that I found not only original, but really smart, was the author’s decision to take out the ‘teachings’ from the storyline itself, and to put them at the end of the book in an appendix. That made it easy for the reader to choose whether to focus on the story, or the teachings, and I really appreciated that. While I found the plot a bit weak, the information I learned while reading the book made up for that weakness. In any case, the characters are all compelling and well-developed. -A page with the Catholic take on animism, which is quite interesting. This entry was posted in Biology, Book Reviews, Science and tagged Animism, Biology, book review, Daniel Quinn, science, spiritual fiction, Story of B. Bookmark the permalink.